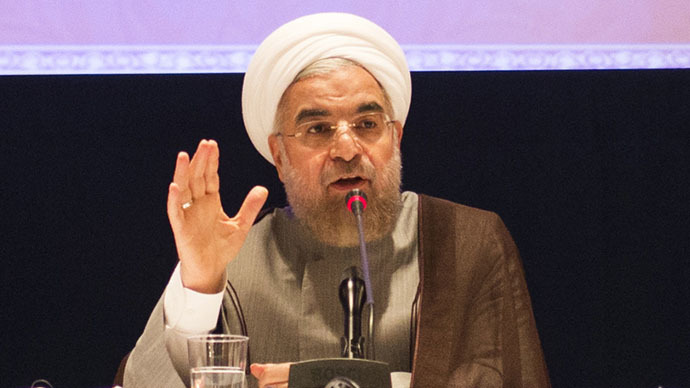 "We will not sign any deal unless all sanctions are lifted on the same day ... We want a win-win deal for all parties involved in the nuclear talks," Rouhani said in a televised speech on Thursday. The President's comments come as a blow to US President Barack Obama’s efforts to sell the deal to its opponents, both in the US and abroad. Supporters of the deal, which was negotiated last week at marathon talks in Switzerland and is to be finalized in June, say the sanctions relief for Iran would be gradual, and implemented in response to Iran’s moves to scale down its nuclear program. They could be reversed in case of non-compliance, they argue. Obama has called the plan the best deal possible at the moment. "Our goal in the talks is to preserve our nation's nuclear rights. We want an outcome that will be in everyone's benefit," President Rouhani said in a ceremony to mark Iran's National Day of Nuclear Technology. Iranian Supreme Leader Ali Khamenei said not reaching a nuclear deal would be better than reaching a bad deal for Iran, and Tehran’s position in that regard had not changed. Khamenei added that Tehran would not consider a postponement of the June 30 deadline for reaching a final nuclear deal “the end of the world.” He also said that Iran would not allow international inspections, which the deal is expected to include, as these could compromise its military secrets. “Based on past experience, I was never optimistic about negotiating with the United States,” Khamenei said. Previously, Iranian Foreign Minister Javad Zarif questioned on his Twitter account the statements from Western leaders that claimed the sanctions would be lifted gradually.